Submitted by Quest-News-Serv... on Mon, 05/26/2014 - 02:01. 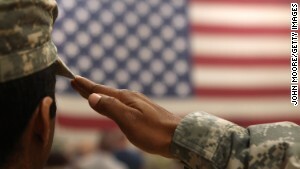 (CNN) -- At least 40 U.S. veterans died waiting for appointments at the Phoenix Veterans Affairs Health Care system, many of whom were placed on a secret waiting list. The secret list was part of an elaborate scheme designed by Veterans Affairs managers in Phoenix who were trying to hide that 1,400 to 1,600 sick veterans were forced to wait months to see a doctor, according to a recently retired top VA doctor and several high-level sources. For six months, CNN has been reporting on extended delays in health care appointments suffered by veterans across the country and who died while waiting for appointments and care. But the new revelations about the Phoenix VA are perhaps the most disturbing and striking to come to light thus far. Internal e-mails obtained by CNN show that top management at the VA hospital in Arizona knew about the practice and even defended it. There's an "official" list that's shared with officials in Washington and shows the VA has been providing timely appointments, which Foote calls a sham list. And then there's the real list that's hidden from outsiders, where wait times can last more than a year. Are we fulfilling our promise to veterans? 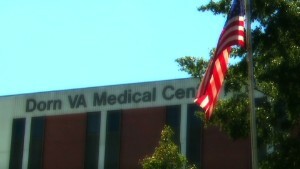 "The scheme was deliberately put in place to avoid the VA's own internal rules," said Foote in Phoenix. "They developed the secret waiting list," said Foote, a respected local physician. The VA requires its hospitals to provide care to patients in a timely manner, typically within 14 to 30 days, Foote said. According to Foote, the elaborate scheme in Phoenix involved shredding evidence to hide the long list of veterans waiting for appointments and care. Officials at the VA, Foote says, instructed their staff to not actually make doctor's appointments for veterans within the computer system. Instead, Foote says, when a veteran comes in seeking an appointment, "they enter information into the computer and do a screen capture hard copy printout. They then do not save what was put into the computer so there's no record that you were ever here," he said. According to Foote, the information was gathered on the secret electronic list and then the information that would show when veterans first began waiting for an appointment was actually destroyed. "That hard copy, if you will, that has the patient demographic information is then taken and placed onto a secret electronic waiting list, and then the data that is on that paper is shredded," Foote said. "So the only record that you have ever been there requesting care was on that secret list," he said. "And they wouldn't take you off that secret list until you had an appointment time that was less than 14 days so it would give the appearance that they were improving greatly the waiting times, when in fact they were not." I feel very sorry for the people who work at the Phoenix VA. They all wish they could leave 'cause they know what they're doing is wrong. Foote estimates right now the number of veterans waiting on the "secret list" to see a primary care physician is somewhere between 1,400 and 1,600. "I feel very sorry for the people who work at the Phoenix VA," said Foote. "They're all frustrated. They're all upset. They all wish they could leave 'cause they know what they're doing is wrong. "But they have families, they have mortgages and if they speak out or say anything to anybody about it, they will be fired and they know that." Several other high-level VA staff confirmed Foote's description to CNN and confirmed this is exactly how the secret list works in Phoenix. Foote says the Phoenix wait times reported back to Washington were entirely fictitious. "So then when they did that, they would report to Washington, 'Oh yeah. We're makin' our appointments within -- within 10 days, within the 14-day frame,' when in reality it had been six, nine, in some cases 21 months," he said. Thomas Breen was so proud of his time in the Navy that he wanted to be treated only at a VA facility, his family says. In the case of 71-year-old Navy veteran Thomas Breen, the wait on the secret list ended much sooner. "We had noticed that he started to have bleeding in his urine," said Teddy Barnes-Breen, his son. "So I was like, 'Listen, we gotta get you to the doctor.' "
Teddy says his Brooklyn-raised father was so proud of his military service that he would go nowhere but the VA for treatment. 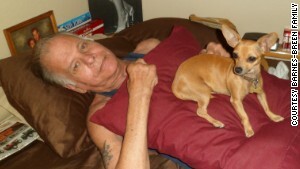 On September 28, 2013, with blood in his urine and a history of cancer, Teddy and his wife, Sally, rushed his father to the Phoenix VA emergency room, where he was examined and sent home to wait. "They wrote on his chart that it was urgent," said Sally, her father-in-law's main caretaker. The family has obtained the chart from the VA that clearly states the "urgency" as "one week" for Breen to see a primary care doctor or at least a urologist, for the concerns about the blood in the urine. "And they sent him home," says Teddy, incredulously. Sally and Teddy say Thomas Breen was given an appointment with a rheumatologist to look at his prosthetic leg but was given no appointment for the main reason he went in. No one called from the VA with a primary care appointment. Sally says she and her father-in-law called "numerous times" in an effort to try to get an urgent appointment for him. She says the response they got was less than helpful. "Well, you know, we have other patients that are critical as well," Sally says she was told. "It's a seven-month waiting list. And you're gonna have to have patience." Sally says she kept calling, day after day, from late September to October. She kept up the calls through November. But then she no longer had reason to call. Thomas Breen died on November 30. The death certificate shows that he died from Stage 4 bladder cancer. Months after the initial visit, Sally says she finally did get a call. "They called me December 6. He's dead already." Sally says the VA official told her, "We finally have that appointment. We have a primary for him.' I said, 'Really, you're a little too late, sweetheart.' "
At the end is when he suffered. He screamed. He cried. Sally says her father-in-law realized toward the end he was not getting the care he needed. "At the end is when he suffered. He screamed. He cried. And that's somethin' I'd never seen him do before, was cry. Never. Never. He cried in the kitchen right here. 'Don't let me die.' "
Teddy added his father said: "Why is this happening to me? Why won't anybody help me?" Teddy added: "They didn't do the right thing." Sally said: "No. They neglected Pop." Foote says Breen is a perfect example of a veteran who needed an urgent appointment with a primary doctor and who was instead put on the secret waiting list -- where he remained hidden. Foote adds that when veterans waiting on the secret list die, they are simply removed. "They could just remove you from that list, and there's no record that you ever came to the VA and presented for care. ... It's pretty sad." Foote said that the number of dead veterans who died waiting for care is at least 40. "That's correct. The number's actually higher. ... I would say that 40, there's more than that that I know of, but 40's probably a good number." CNN has obtained e-mails from July 2013 showing that top management, including Phoenix VA Director Sharon Helman, was well-aware about the actual wait times, knew about the electronic off-the-books list and even defended its use to her staff. In one internal Phoenix VA e-mail dated July 3, 2013, one staffer raised concerns about the secret electronic list and raised alarms that Phoenix VA officials were praising its use. "I have to say, I think it's unfair to call any of this a success when Veterans are waiting 6 weeks on an electronic waiting list before they're called to schedule their first PCP (primary care physician) appointment," the e-mail states. "Sure, when their appointment is created, it can be 14 days out, but we're making them wait 6-20 weeks to create that appointment." The e-mail adds pointedly: "That is unethical and a disservice to our Veterans." Last year and earlier this year, Foote also sent letters to officials at the VA Office of the Inspector General with details about the secret electronic waiting list and about the large number of veterans who died waiting for care, many hidden on the secret list. Foote and several other sources inside the Phoenix VA confirmed to CNN that IG inspectors have interviewed them about the allegations. CNN has made numerous requests to Helman and her staff for an interview about the secret list, the e-mails showing she was aware of it and the allegations of the 40 veterans who died waiting on the list, to no avail. But CNN was sent a statement from VA officials in Texas, quoting Helman. "It is disheartening to hear allegations about Veterans care being compromised," the statement from Helman reads, "and we are open to any collaborative discussion that assists in our goal to continually improve patient care." Just before deadline Wednesday, the VA sent an additional comment to CNN. It stated, in part: "We have conducted robust internal reviews since these allegations surfaced and welcome the results from the Office of Inspector General's review. We take these allegations seriously." The VA statement to CNN added: "To ensure new Veterans waiting for appointments are managed appropriately, we maintain an Electronic Wait List (EWL) in accordance with the national VHA Scheduling Directive. The ability of new and established patients to get more timely care has showed significant improvement in the last two years which is attributable to increased budget, staffing, efficiency and infrastructure." Foote says Helman's response in the first statement is stunning, explaining the entire secret list and the reason for its existence was planned and created by top management at the Phoenix VA, specifically to avoid detection of the long wait times by veterans there. "This was a plan that involved the Pentad, which includes the director, the associate director, the assistant director, the chief of nursing, along with the medical chief of staff -- in collaboration with the chief of H.A.S." The Phoenix VA's "off the books" waiting list has now gotten the attention of the U.S. House Veterans Affairs Committee in Washington, whose chairman has been investigating delays in care at veterans hospitals across the country. According to Rep. Jeff Miller, chairman of the House Committee on Veterans' Affairs, what was happening in Phoenix is even worse than veterans dying while waiting for care. Even as CNN was working to report this story, the Florida Republican demanded the VA preserve all records in anticipation of a congressional investigation. "It appears as though there could be as many as 40 veterans whose deaths could be related to delays in care. Were you made aware of these unofficial lists in any part of your look back?" asked Miller. "Mr. Chairman, I was not," replied Dr. Thomas Lynch, assistant deputy undersecretary, Veterans Health Administration. Congress has now ordered all records in Phoenix, secret or not, be preserved. That would include the record of a 71-year-old Navy veteran named Thomas Breen. Curt Devine and Jessica Jimenez contributed to this report.